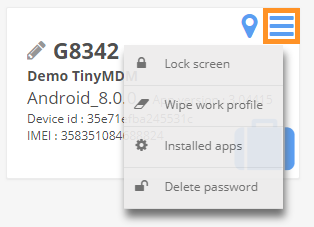 How to remotely lock or unlock a device from your TinyMDM dashboard? If you have any suspicion of theft or compromised device, instantly lock device to protect your data: this option will secure the device by forcing the user to enter the password to unlock it. You can also remove the password and remotely unlock the device so the end user can regain access to it if needed. You will be able to see the last lock request exact time and date on each device for security purposes.